The Eckhart office building is an adaptive reuse of a restaurant. It houses offices for an international nutritional supplement manufacturing company who wanted a healthy indoor and highly productive environment. Employee health and productivity are enhanced by a healthy indoor environment created with daylighting and non toxic building materials. Sustainability features include adaptive reuse of an existing building rather than demolishing it, natural cooling, energy efficiency and recycle content or resource efficient, long lasting and low maintenance materials. It was determined that the adaptive reuse of the existing building was inherently more sustainable than starting from scratch because of avoiding the solid waste problem and losing the embodied energy in the existing building materials. A site was found that is located near to where most of the employees reside, thereby reducing the tremendous energy use of commuting. The selected building was a 1960's circa "energy hog. It was seismically and energy efficiency upgraded beyond code requirements. This will also extend its useful life. The building envelope was insulated and new windows were installed. The pultruded fiberglass windows are double-glazed with low-E2 argon filled insulating glass that is also an acoustical barrier to the busy street. The HVAC upgrading included new high efficiency heating and air conditioning equipment with both economizer and night cooling cycles. 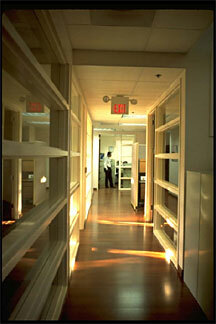 Daylighting is provided with windows for exterior offices and skylights for interior open office areas. Borrowed light is also provided by glazed corridors. Electrical backup ambient lighting is provided by high color rendering, daylight matching, fluorescent T8 lamps controlled by light level and occupancy sensors. The mercury toxic waste disposal problem of conventional fluorescent lamps was avoided by using low mercury lamps. Non toxic, long lasting and low maintenance materials include hardwood wood simulated office floors and other areas of stone and tile floors with non VOC adhesives. Carpet was only used in a second floor area for acoustical impact isolation. We thereby avoided a major solid waste problem since carpet is generally changed every few years. We also avoided the other carpet problems of material toxicity, holding of toxic materials carried in on shoes, holding of allergens and dust mites, etc. A unique feature of the project is exterior window trim made from recycled plastic lumber. AIM perfected this previously unheard of use of recycled plastic lumber in our own office remodel. The biggest challenge to the green goals was the unexpected cost of additional structural work required because the existing building structure had been improperly modified and weakened over the years.